It could have been awful. It could have been dismal and brutal. Instead, I happened to share this part of the journey with a delightful young woman and we both had a riot! Getting up Albert first required traversing a long stretch of trail that snaked along between a dripping wet rock wall on our left and a pretty much sheer drop off on our right. That’s where Rosie found me … standing there marveling at the living rock wall of green with water dripping down. Such incredible beauty! Such marvelous magic! There I was … trying to capture this glorious sight with my camera for you, dear reader, and having a hard time seeing through my own tears. Have you ever seen something so wondrously beautiful that it brings you to tears? That’s where I was when Rosie came up the trail, head down watching her every step, carefully picking her way between mud and rocks. We’d met briefly the night before at a shelter so we said hi and hiked on together chatting a bit as we went. Occasionally I’d pause to look out over the increasingly impressive views to our right and declare them utterly glorious! Rosie looked up each time and agreed. 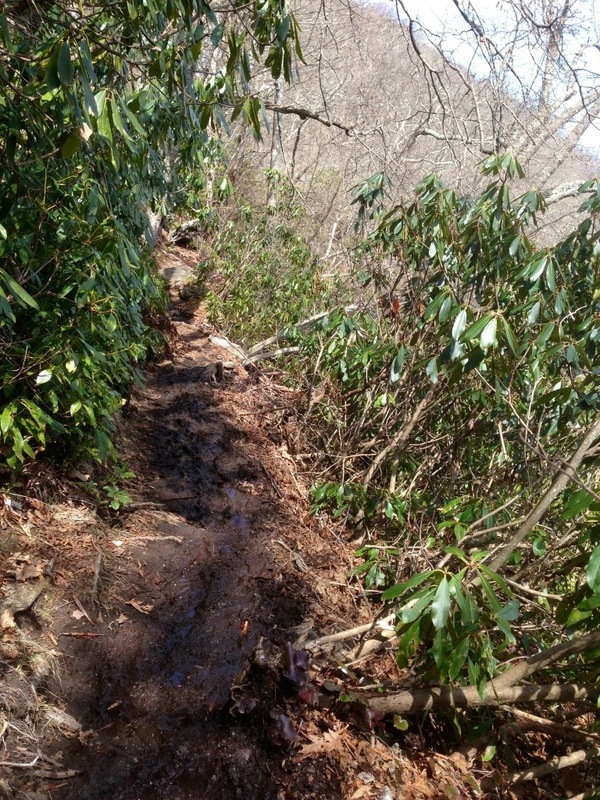 In some places, the trail itself was an 18″ wide stew of black mud and wet rocks. Often the trail would turn and rise sharply to the left and our only available steps were the tangled roots of a tree leeeeeaaning far far out to the right, somehow defying gravity over the drop off below. Root, mud, root, mud, water, water, rock, mud, root! When we stopped long enough to lift our eyes from the trail, our views over the adjacent mountains was spectacular! At one point, the trail leveled out and moved away from the cliff we’d been following and meandered through a rhododendron forest dipping lower and lower. 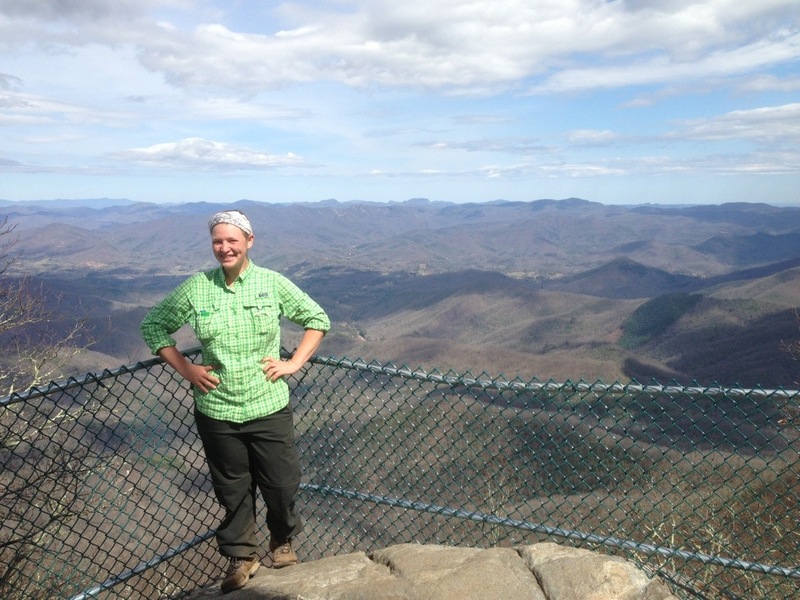 Rosie chatted away about her family (who she dearly missed), her future (which she was quite unsure of), and of her decision to leave the trail at Winding Stair Gap a few days ahead. I pointed out that by the end of that day, she would have completed 100 miles of trail which was nothing to sneeze at! I looked up through the forest to a tall mountain ahead ….. and saw this itty bitty teeny tiny little structure at the top. I pointed it out to Rosie. Surely THAT was not the tower we were climbing up to!?!?!? WAY UP THERE??? Noooooo way! Whose brilliant idea was this??? I laughed hysterically … very much like I did when I first walked into Rock Ventures back home in Rochester and saw what was ahead of me. Rosie probably thought I’d gone mad but on we hiked! We would tackle the monster Albert together! A south bound hiker approached and we asked him if there there would be hand over hand maneuvers required and he assured us there was not … only to be careful of the wet places. He was mistaken! Well … coming down the mountain SOBO, hand over hand was not required HOWEVER … going up NOBO … Yeah it was! What could we do? We hiked on! Err …. climbed on. It was not like wall climbing; our path was not vertical. Not quite! There were, however, many places where we needed to take a minute to plot our route up a section and then carefully go up using hands and feet together. Through all this, we swore (mostly me) and laughed (both of us). Some of it was nearly smooth rock to simply lean into and hope our shoes gripped well. 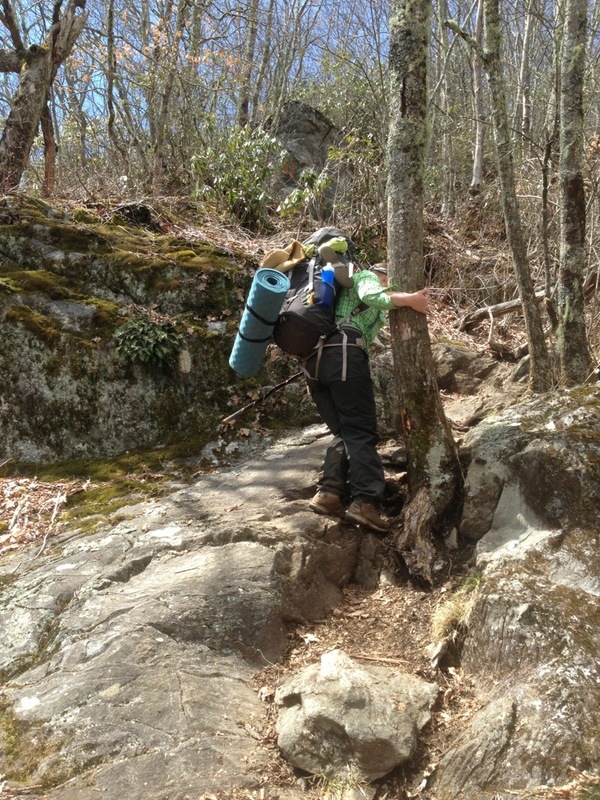 Some of the trail seemed to be assembled of random boulders wedged together. These required gripping rocks and pulling ourselves up to the next boulder. Occasionally, we’d stop the scrambling to catch our breath and survey our surroundings. Damn! We were climbing a mountain! CLIMBING! We heard voices from above … We were nearing the top! 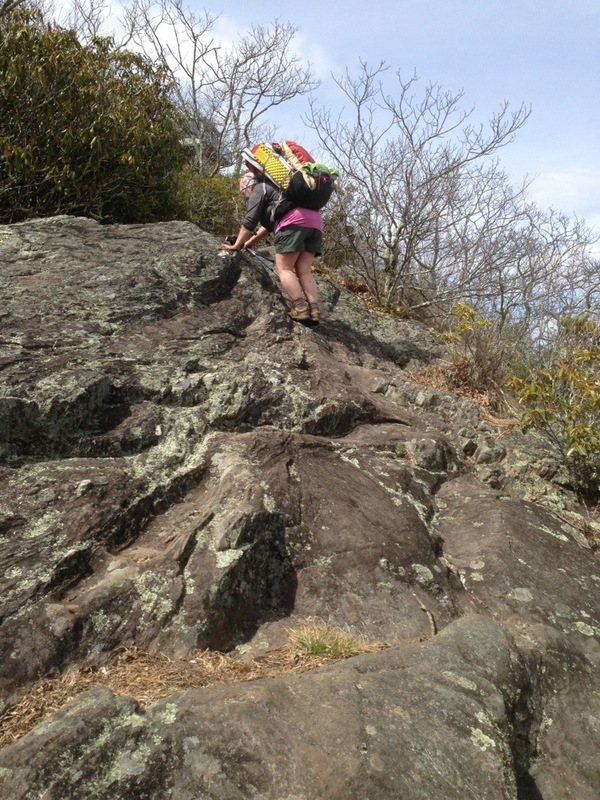 As we emerged from the final bit of brush, there if was … The fire tower we’d seen from below! 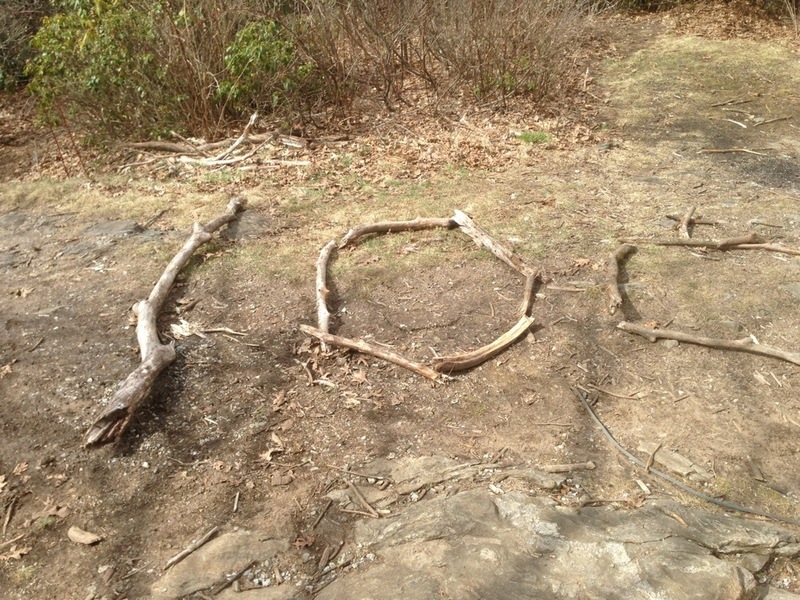 To mark our 100th mile of trail, someone had spelled out 100 in sticks! Rosie and I dropped our packs and hurried up the stairs for our reward … such a view! We’d done it! 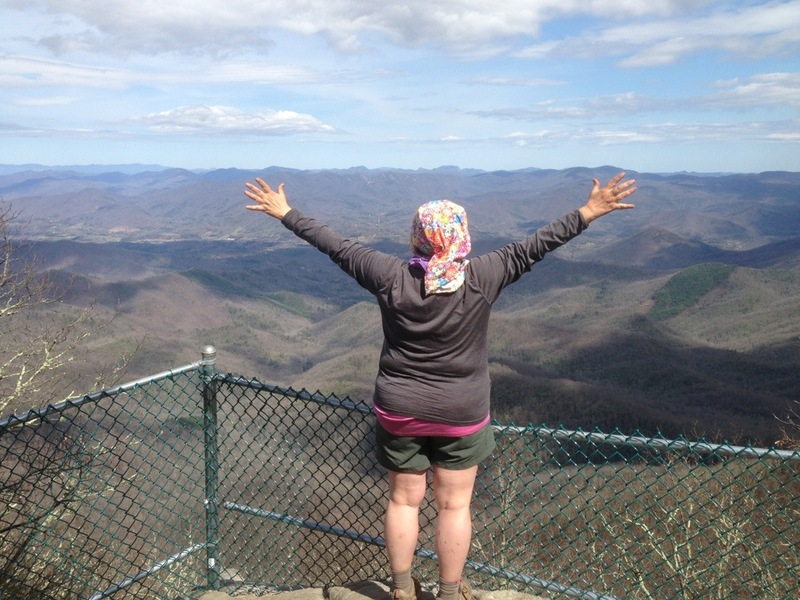 We climbed Albert Mountain … and we had a terrific time doing it! This entry was posted in Uncategorized on April 8, 2013 by justbunny. I am reading Wild right now, about a PCT hiker, and your blog and Karma’s blog. Thank you for the virtual hike. And inspiration to keep rehabbing to someday have an actual hike, of some sort, LOL! I love how your writing is so descriptive. I really enjoy your entries. (I check everyday to see if there is a new one) 😉 Congrats on 100 miles! congrats on the 100 mile mark. i could only see the 100 mile in sticks photo too. Hi Bunny! Just catching up on your posts here. Looks like you’re starting to have some real fun! So glad! Think about you most days. Send woo whenever I do. Can’t wait for June. Oh and congrats on 100 miles! Way to go! Are you still on the trail? I hope everything is alright. Mostly in places little or no signal.